Wideband Global SATCOM (WGS)�provides flexible, high-capacity communications for the Nation's warfighters through operationalization of the Wideband Global SATCOM and associated control systems. WGS will provide a quantum leap in communications bandwidth for marines, soldiers, sailors and airmen. WGS is a multi-Service program that leverages commercial methods and technological advances in the satellite industry to design, build, launch and support a constellation of highly capable military communications satellites. 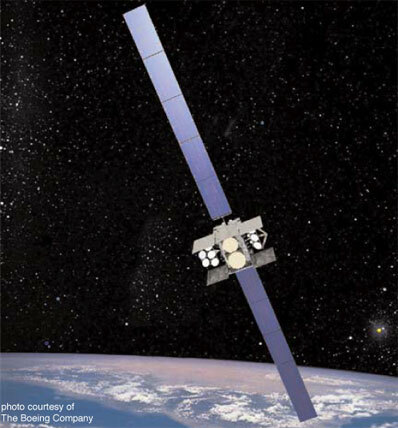 Upon its first launch into geosynchronous orbit in 2007, WGS Space Vehicle (SV) 1 will be the Department of Defense's highest capacity communications satellite. A constellation of five satellites will provide service in both the X and Ka-band frequency spectrums. WGS will supplant X-band communications now provided by the Defense Satellite Communications System (DSCS) and one-way Ka-band service provided by the Global Broadcast Service (GBS). Additionally, WGS will provide a new two-way Ka-band service. These digitally channelized and transponded satellites provide a quantum leap in communications capacity, connectivity and flexibility for U.S. military forces while seamlessly integrating with existing and programmed X- and Ka-band terminals. WGS will provide essential communications services for Combatant Commanders to command and control their tactical forces. Tactical forces will rely on WGS to provide high-capacity connectivity into the terrestrial portion of the Defense Information Systems Network (DISN). The first three WGS satellites will be launched in 2007 and 2008. Both the Delta 4 and Atlas 5 Evolved Expendable Launch Vehicles (EELV) will be used. Satellites 4 and 5 are anticipated for launch in 2011 and 2012. The Wideband Global SATCOM system is composed of three principal segments: Space Segment (satellites), Control Segment (operators) and Terminal Segment (users). The MILSATCOM Systems Wing (MCSW) is responsible for development, acquisition fielding and sustainment of the WGS Program.